Send a gift card to a friend or loved one with a message of hope and opportunity. Select from the countries and designs below and Five Talents will mail a card on your behalf to the individual or family at the address you designate. This gift supports ministry in Bolivia, helping families to start and develop small businesses. Your support means that new members will receive training in budgeting, savings, cost of credit, business planning, nutrition and discipleship. They will also learn how to invest and grow their businesses, meaning sustainable income to support their families. 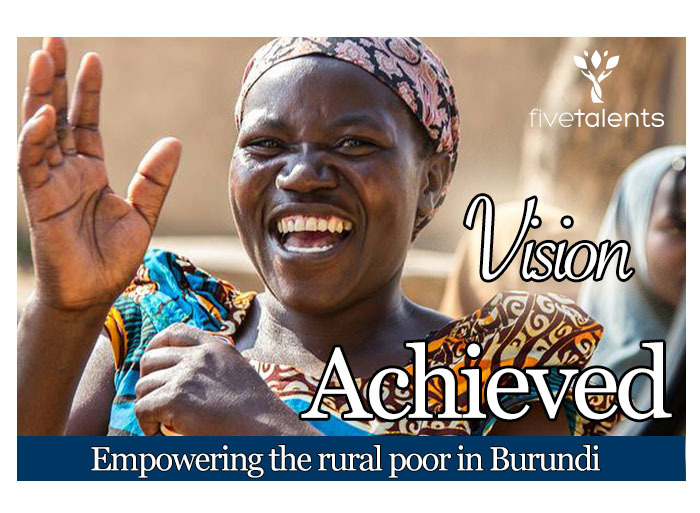 This gift supports ministry in Burundi, where Five Talents serves over 45,000 members through financial literacy, community savings, and business development. Your support empowers new members with tools to save, develop, and grow small businesses. This enables parents to provide education, healthier food, and a brighter future for their families. This gift supports development in Indonesia, serving the vulnerable poor in the slums of Jakarta. Five Talents and its partner form savings and loan groups that serve as hubs for other services, including business skills training, spiritual development, health care and even workshops on personal care. Your support opens opportunities for the poor and empowers new business. This gift supports vulnerable communities in South Sudan, a country affected by war and famine. By working alongside local churches, Five Talents helps to build peace and promote sustainable development through community-owned savings programs.